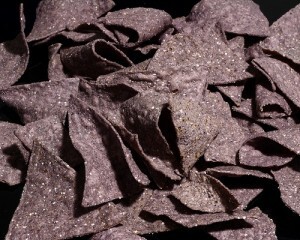 One of the first foods to be banished from my home, and it stays in perdition, was blue corn tortilla chips. Because they are funny looking? Or taste bad? Au contraire, because they are one of the most irresistible foods in the universe, and the bag would be gone within hours, even if it were intended for guests. Touted as being healthier than regular corn, with wise dissenters pointing out that there are much more efficient ways than carb loading to get an insignificantly higher level of vitamins and protein, blue corn is just plain delicious. 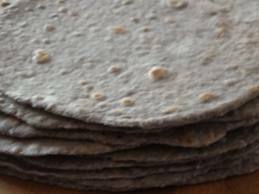 Blue corn meal can be substituted for regular masa in Latino/Southwestern preparations, but handles differently and can be challenging (but not impossible) when making tortillas (mixing in some regular flour or cornmeal helps). 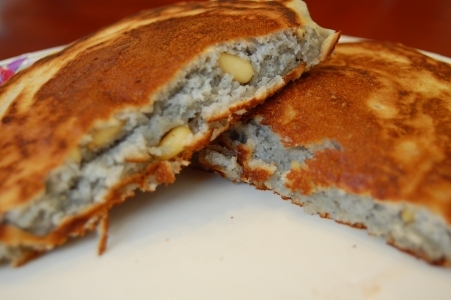 A visit to Santa Fe is not complete without a breakfast or two of blue corn pancakes, most recently tracked down at the coffee shop on the main square (there’s only one, you cannot miss it). 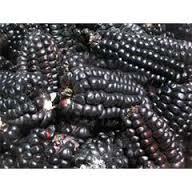 Fresh blue corn is available in farmers markets in Peru, as evidenced on a recent visit to Cuzco, Peru. It showed up as a sorbet, both at an otherwise non-descript airport hotel and as a garnish to a passion fruit tart at one of Lima’s top restaurants. 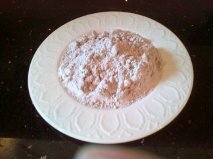 Want a taste of something sweet made from blue corn? 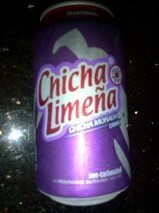 Don’t hop a plane, simply locate the Peruvian section in your local Latino market and look for a can of Blue Maize soda! Interesting. 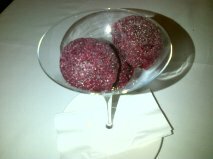 Blue corn sorbet, was it gritty? It had a little texture to it, but not so much as to be gritty. 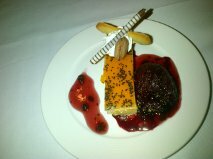 Delicious, by the way!